Massive Fort Wayne on the Detroit riverfront reminds us of the military’s preparation for a major war with Britain in the 1840s, a war that was, thankfully, never fought. The Detroit Arsenal in Dearborn reminds us of the extensive military efforts that were nee ded to drive American Indians off their ancestral lands in the Midwest. From the 1600s until the last quarter of the 19th century, European settlers fought with Indians for control of North American land. Typically, Europeans would try to farm areas that seemed unoccupied to them. Sometimes Indians and the settlers got along peacefully but, on many other occasions, Indians raided the homes and farms of the settlers. Those who were not killed sought protection from the military. Indeed, many of the settlers called for the removal of Indians. To cut down such bloody encounters in the pre-Revolutionary Era, the British tried to keep settlers east of the crest of the Appalachians leaving the west part of the continent for Indians. This was not very successfu since the British could not keep settlers out of Indian lands. Then the British aligned themselves with various Indian tribes in their war with the French in the early 1700s and then, later, in their futile efforts to defeat the Revolutionists. Shortly after the United States won control of the upper Midwest including Michigan—the early 1790s—European settlers came to the area and the challenge of too many militant Indians had to be faced. Frequently, Army troops and local militia men would conduct summer campaigns against the Indians. Toward the end of the summer, Indian leaders would be brought to a conference with a representative of the US government and strongly encouraged to sign a treaty. The philosophy of this era held that Indian tribes were sovereign nations that could equitably negotiate their rights. The Indians would typically cede their control of vast amounts of land so that settlers could occupy it. In return, the Indians received some cash payment from the federal government. In some cases they got additional benefits. In Michigan, many of the tribes were promised an education, hence the continuing practice of Michigan Native Americans paying no tuition at state universities. In Wisconsin, Indians retained the right to hunt and fish on the lands they ceded. Quite frequently, a small amount of land was reserved for the Indians to use as they wished. In 2006, Michigan had 12 Indian reservations that resulted from the treaties signed in the first three decades of the 19th century: Bay Mills, Grand Traverse, Hannahville, Huron Potawatomi, Isabella, L’Anse, Lac Vieux Desert, Little River, Little Traverse Bay, Ontonagon, Pokagon Band of Potawatomi and the Sault Ste. Marie reservation. Reflecting late medieval military theory, the Army built the Detroit Arsenal as a walled compound 360 feet to the side, within which the personnel and supplies were safe. The largest building is pictured on this page—a well constructed and appealing Commandant’s Quarters. 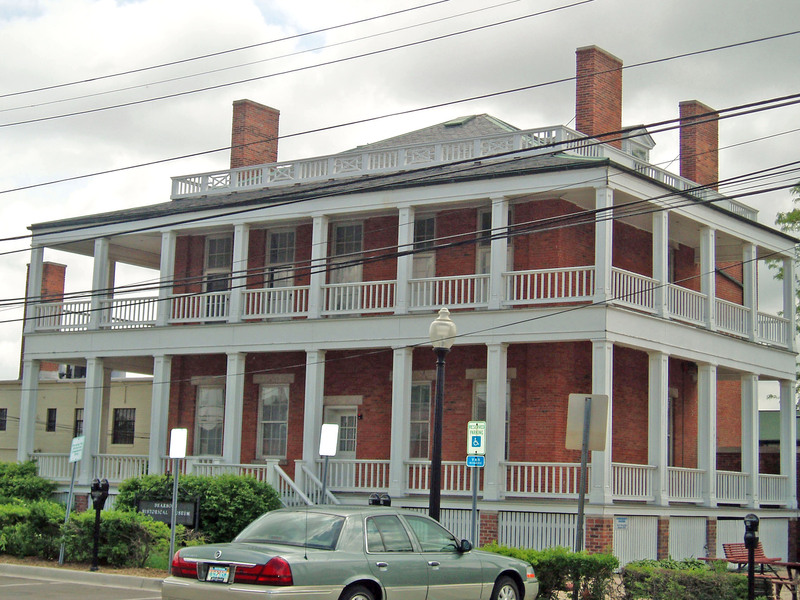 This is a federal style building in red brick. A marvelous white porch was constructed on the side away from the one facing Michigan Avenue. Presumably, this porch overlooked the enclosed court yard so the commandant could watch his troops as they perfected their marching or battle formations. I am not sure how useful the Detroit Arsenal was to the military since, by the 1840s and 1850s, warfare against Indians moved far to the west. The facility was a recruiting and training facility during the Civil War but, in 1875, the federal government ceased using the building. The Commandant’s Quarters subsequently served as a library, a meeting hall, and a fire station. Dearborn’s Historical Commission acquitted the building in 1949 and opened their museum in it one year later. 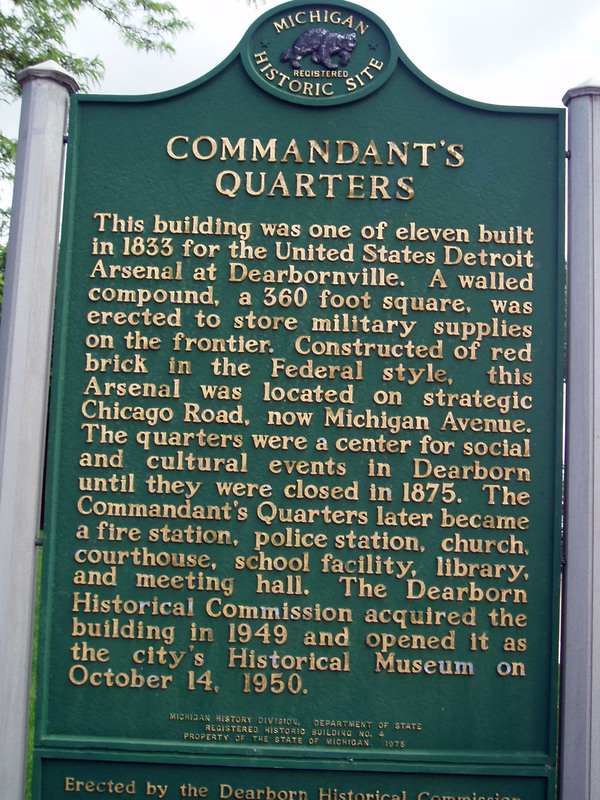 Two other buildings from the Detroit Arsenal may be seen in Dearborn. The McFadden-Ross home is at 915 Brady and is open to the public from time to time. 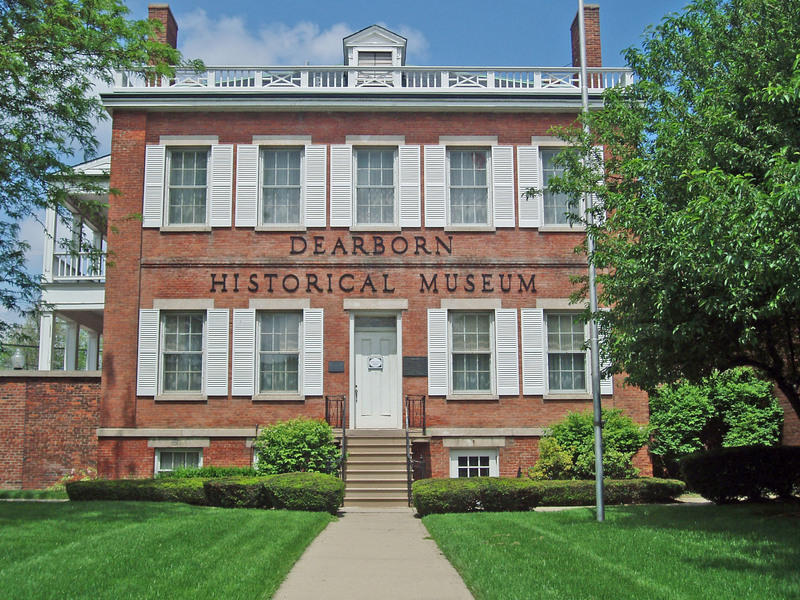 It is also administered by the Dearborn Historical Museum. Another structure, the Gardner House, was once moved to Greenfield Village but then returned to the grounds of the McFadden-Ross home.